Asparagus are in season, but Miriam and I have difficulty with it. 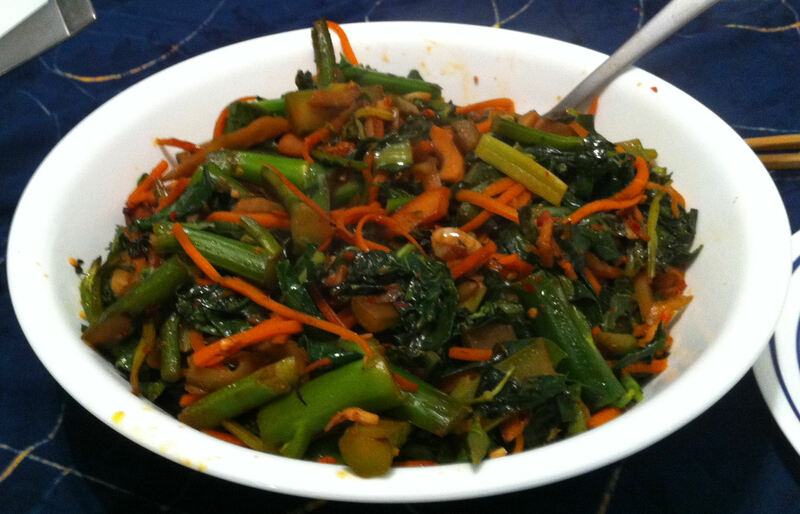 I decided to make two vegetable dishes for this Sunday’s dinner. 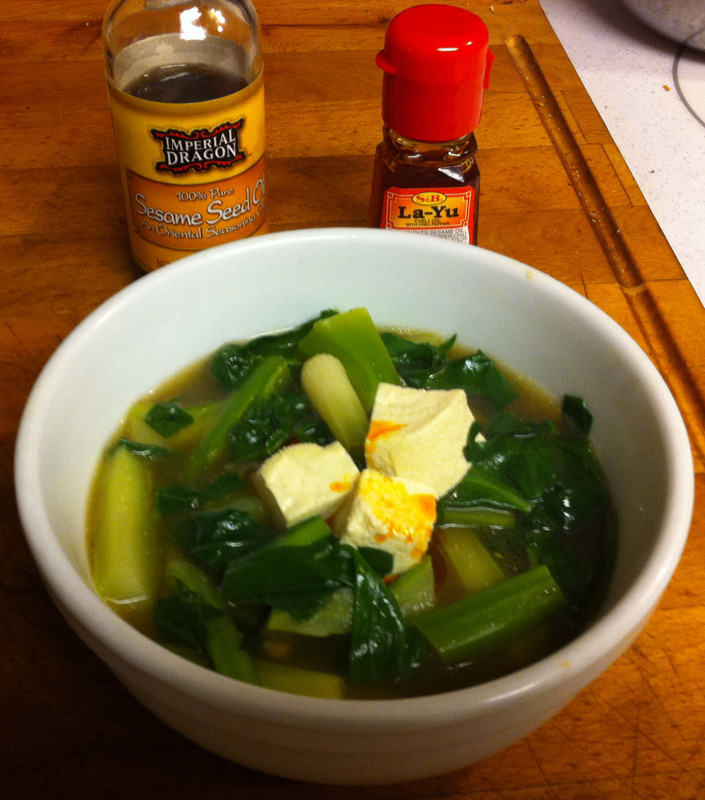 I found some young Chinese broccoli (kai-lan) for us and I made it with a sight Macanese twist. On Christmas morning my family likes to go out for dim sum (点心; snacks), Chinese small plates. Frequently we go to Tai-pan in Palo Alto. In addition to the many and varied flavors, Tia-pan’s presentation is always impeccable—no chopped vegetables sloshed on a plate. 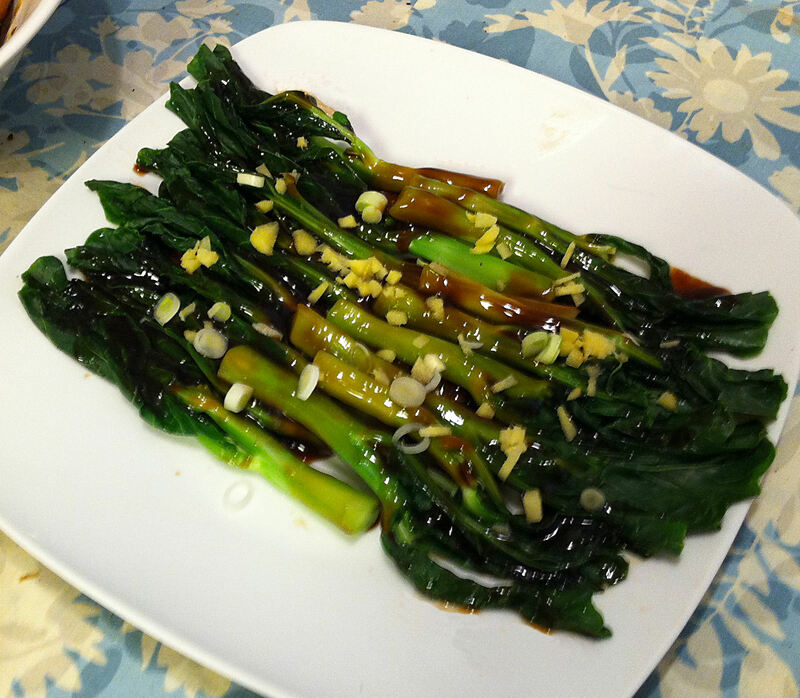 Of the many excellent dishes we had, one was the one we always order is Chinese Broccoli with Oyster Sauce. On Christmas morning my family likes to go out for dim sum (点心; snacks), Chinese small plates. For the last several years we have gone to Tai-pan in Palo Alto, but this year Miriam talked up into trying something new. It was not quite a disaster, her suggested restaurant was over-flowing with a four hour wait, but we finally found a strip mall place that was actually excellent. 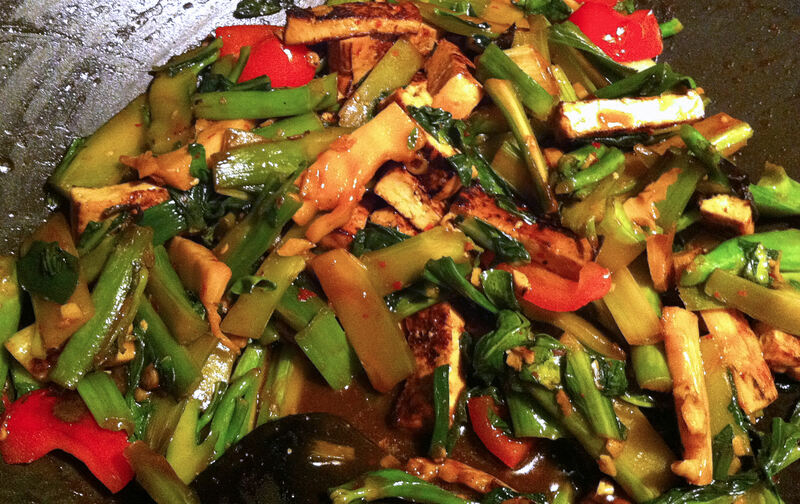 I bought some fresh tofu last Saturday that I was planning to make into mapo doufu. Jan’s schedule interfered. She had work on Monday and Tuesday nights. When she came back she did not want anything as spicy as mapo doufu. It is a constant struggle to keep week day meals interesting. My mother, Claudia, was a strict budgeter; with 5 kids to feed she had to be. However, the result of this budgeting was that frequently you could tell what day it was by what was on the table. I had the same problem when I worked off shore, “If it is Tuesday it must be T-bone steaks.” No matter how good the food is, it gets boring if it is predictable. Tonight’s dinner is Mopo Doufu and Beef with Mushrooms, neither of these dishes is heavy on the leafy greans. I need a side dish to go with them. 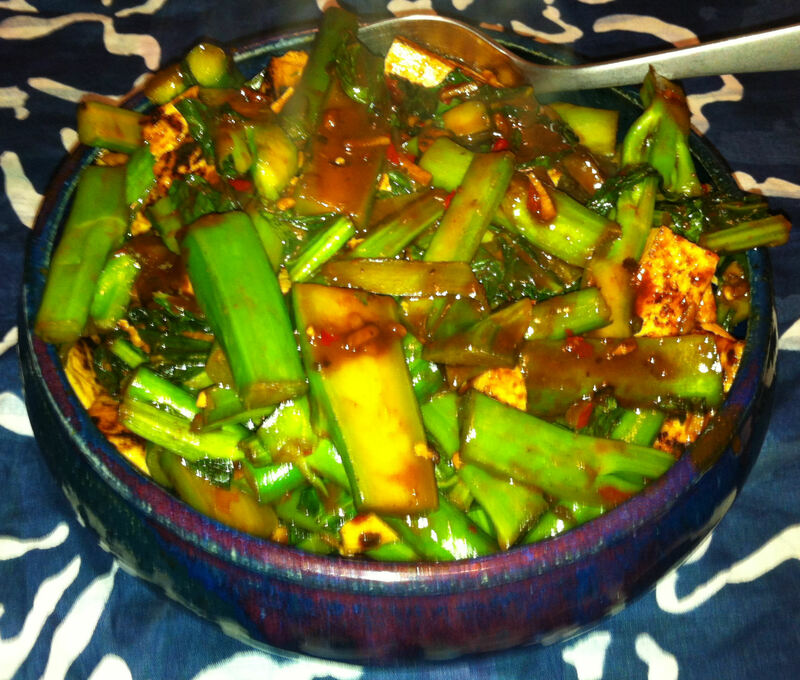 Everyone in my household likes Chinese Broccoli (gai lan), so this is just another stir fry. Fun question: I was watching A Taste of History and I found out a bit of American history. Who introduced tofu to America? This dish is not what I went to the store to prepare. As I was sitting and thinking about dinner I remembered the stir-fried lettuce stem I was served in Chengdu. When I got to Lion Market, I found that they did not have it. I had seen it there before, so I guess it simply is not in season. 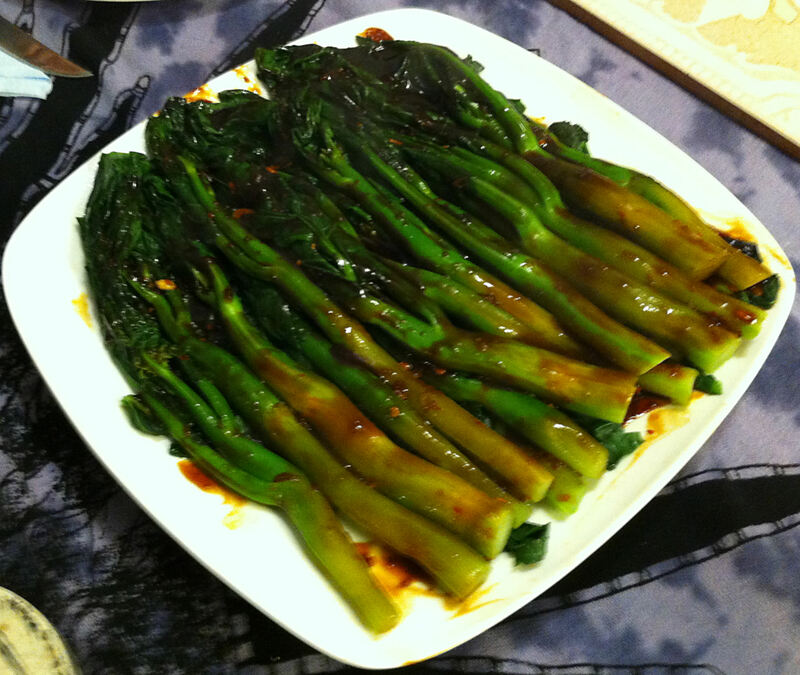 What was in season was Chinese broccoli (gai-lan in Mandarin). What I normally do with this vegetable is make Spice Chicken and Noodles, but that is a real production number and takes hours to prepare. I wanted something simpler for a week day meal. The reason that most of my recipes start with “Karl’s …” is so I can tell the ones I downloaded from the internet (usually for reference) from the ones I have changed enough to call my own. This is one of those occasions where I had a dish in my mind (a faded memory of some dish served at a Chinese banquet), but how it was made and what when into it was a mystery. One search technique I used for this recipe was Google Images. Using the search “clay pot chicken” brought up hundreds of pictures that I could then scan for ones that “looked” like what was in my memory of that dish in China. However, the recipes I found on the internet did not come close to what I was looking for. I had to be creative. I took an ingredient from this recipe. Oyster sauce as the marinade base seemed a good choice, I was also making Ma po Dofu for this meal so I did not want to use Hoisin (another common marinade ingredient in clay pot chicken).